Send Steve Smith to Robben Island. Cut one of Cameron Bancroft’s fingers off. Take David Warner’s OLED away so he can’t watch his cartoons. So many have been eager to deliver their punishment recommendations for Australia’s ball-tampering crims in Cape Town. And so many have come up with sanctimonious drivel. Life bans? Are you serious? Twelve-month bans? No way. Smith, Warner and Bancroft have been sent home and should be suspended for the next Test series, which is two away Tests against Pakistan, as well being slapped with a chunky fine. That period would also mean missing 10 one-day internationals and four international T20 games. Smith should be stripped of the captaincy and Warner of the vice-captaincy. But they shouldn’t be frozen out of returning to leadership roles. Perhaps a two-year absence would be plenty of time to reassess the responsibilities and expectations of being Australia’s Test cricket captain and deputy. Punishments are meant to befit the severity of the offence. This was a case heavy with bare stupidity than the meticulous plotting of master criminals. Yellow sticky tape? What the? Who was the Officeworks stationery guru that stood up on the grassy knoll grasping the roll of yellow sticky tape? Brain activity was certainly stationary. Too much emphasis has been placed on the pre-meditation in the clumsy dressing room cheating plan. The heat-of-the-battle leniency stinks, at least in a non-contact sport like cricket. The argument that Greg Chappell’s 1981 underarm plot wasn’t as bad as this current ball-tampering saga is nuts. Oh, but it was within the rules. And it was in the heat of the battle; as if Chappell during all the time he was relaying his orders to his brother Trevor and returning to his fielding position couldn’t absorb it was a ridiculous idea. That low act directly influenced the result of a match. It was shameful. It was way more cowardly than what transpired at Newlands. Bancroft’s whacky and sticky plan wasn’t even assured of working. If he had got enough scratches onto the Kookaburra, then that wouldn’t have guaranteed it would hoop around corners for the rest of the innings. Thankfully, the lame scheme was picked up early. It didn’t affect the result in any way. The ball wasn’t changed by the umpires. It would’ve been infinitely worse if South Africa had been rolled for 200 with a ball zipping around, the Aussies chased it down to win and the incriminating video footage is picked up later. That’s not a defence for what the Australians planned. But the bitterness lingers a lot longer when the act of cheating definitively affects the result. It’s much better when the EPO-drunk cyclist tests positive in stage two or three of the Tour de France than three days after riding triumphantly down the Champs-Elysees. 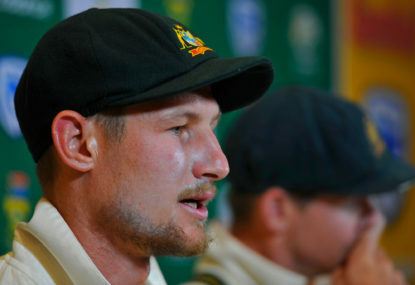 There was some respect for Smith and Bancroft’s frank confessions immediately after the day’s play. Faf du Plessis has been found guilty twice for blatant acts of ball-tampering and yet he’s still in denial, labelling the zipper-assisted and mint-flavoured shockers as “ball shining”. And he was made captain soon after. Michael Atherton did it. So did Shahid Afridi. Martin Crowe admitted to it. Pretty much every international team changes the nature of the ball to varying degrees. Again, that’s no defence for Australia’s Cape Town villains. But it does emphasise how ridiculous their idea was – with the not-so-discreet yellow tape – and especially in 2018 when so many cameras are stalking. It was that poorly conceived that there should be a charge levelled of bringing stupidity into disrepute. Being banned for a few Tests and a chunk of ODIs will help drag Smith out of his bubble and hopefully release him from the win-at-all-costs mentality. He’s a self-confessed cricket nerd. He’s totally absorbed. And there’s plenty to admire in someone so devoted to their craft. But the embarrassment he’s endured already should be enough to ensure he treasures his credibility more than his team’s win-loss ledger. There was no match-fixing. No spot-fixing. He didn’t rap a cricket bat around someone’s head. A 12-month ban for a case like this would be way too excessive. The response from some has been hysterical. There’s a price to pay, but the chance for redemption shouldn’t wait until next year. An AAP writer for more than a decade, Will Knight does his best to make sense of all things cricket, rugby union and rugby league, all while trying to have a laugh along the way. You can find him on Twitter @WKnightrider.